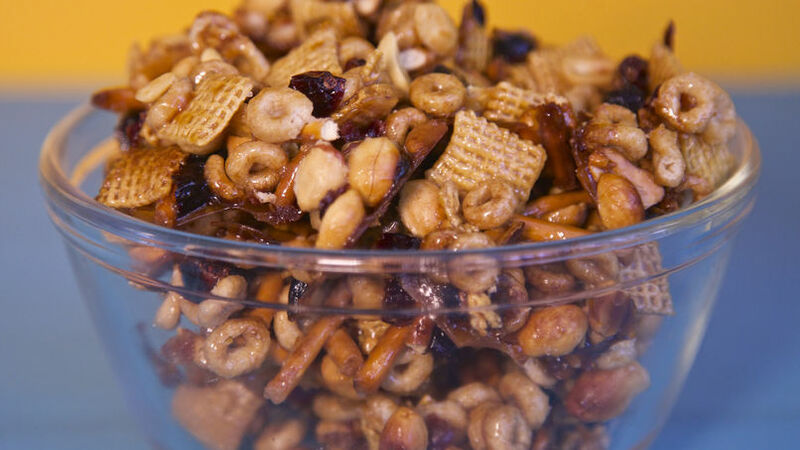 Mix the peanuts, cereals, dried cranberries and pretzels in a bowl. Set aside. Melt butter in a pot. Add the sugar and corn syrup. Place a cooking thermometer in the pot and stir until the temperature reaches 275° F.
Add the vanilla and mix well. Pour the syrup over the cereal mixture. Spread the mixture evenly over 2 sheets of parchment paper. Remove from oven and mix. Return to the oven for 10 more minutes. Remove from oven and mix again. Let cool for 1 hour. Keep an eye on clusters when they're in the oven. From one minute to the next they can burn. Nicole M. Presley WARNING: Once you try this snack, it will become your obsession and you won't be able to stop eating it! These honey nut cereal peanut clusters have been affectionately known in my household as "the best trail mix on Earth." I often make a batch once a month or so on a Sunday evening so the boys and I can munch on them throughout the following week. Another great reason to love this recipe is that it's a good snack for active moms on the go like me. Between work and family life, I need a tiny meal to get me through the day!